Samsung Electronics America has announced that it has surpassed the 60 percent market share threshold in the US 3D TV market, which includes both LED and Plasma televisions. As a result, Samsung has established a commanding lead when it comes to 3D TVs in the US, according to revenue and unit sell-through data from market research company the NPD Group. Specifically, between May 22, 2011 and June 18, 2011, Samsung had a unit and dollar share of 61 percent in the 3D TV market. In addition, the electronics giant had over 50 percent unit and dollar market share between April 2011 and May 2011. Unfortunately, 3D TVs are still expensive and consumers aren't buying them very quickly. 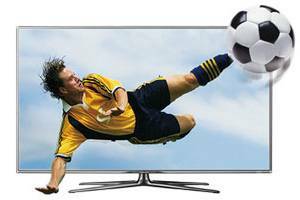 As a result, Samsung is offering a deal: if you purchase a qualified 2011 Samsung 3D TV from a participating authorized retailer, you will receive two pairs of 3D Active glasses (model SSG-3100GB) free of charge, directly from the retailer. Furthermore, Samsung also recently lowered prices on its complete line of glasses. The battery operated 3D Active glasses are now $50. "Clearly consumers are voting with their wallets and choosing the TV that provides a superior 3D experience," John Revie, senior vice president of Home Entertainment at Samsung Electronics America, said in a statement. "Samsung 3D TVs can deliver Full HD 3D, but a TV isn't just about 3D. We also are leaders in design with our gorgeous TVs, and leaders in connected TV with our hugely popular Samsung Apps platform. Consumers don't need to compromise when they choose a Samsung TV." Unlike other approaches to 3D, Samsung's Active 3D Technology delivers up to double the resolution Full HD image (1080p picture for each eye), a wider viewing angle, and no black lines interfering with the picture. Still, you have to wear the glasses. I honestly don't think 3D TVs will hit mass adoption until one of the many sans-glasses technologies becomes standard.